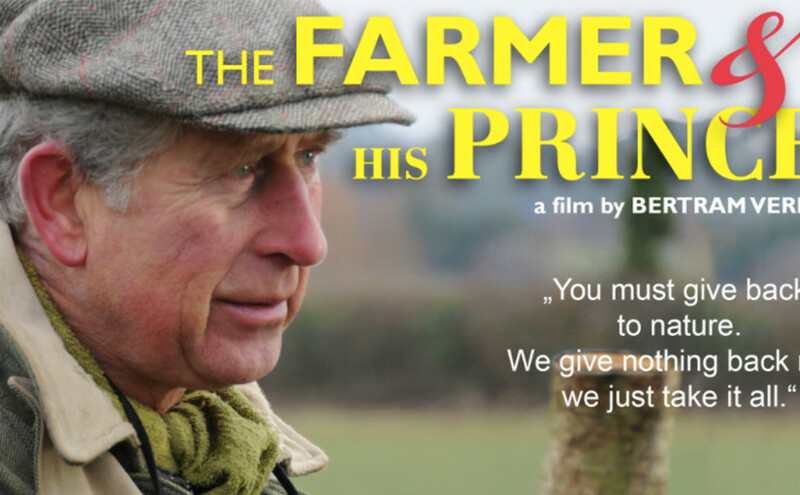 „The Farmer and his Prince“, Movie 80 minutes, by Bertram Verhaag. The film depicts a Prince, who has the vision to feed the world with organic agriculture and heal damaged nature. Alongside his charismatic farm manager David Wilson, he has been pursuing this goal for 30 years. Through poetically impressive images, this unique collaboration portrays how organic agriculture works, and the benefits that emanate from it. Bertram Verhaag observed these two visionaries over the course of five years – through all four seasons. The Prince of Wales already felt strongly about the concept of organic and sustainable farming long before the word “sustainability” was on everyone’s lips. More than 30 years ago, he realized that other farmers could only be swayed to cultivate their land without poisons and in harmony with nature, if they were presented with a practical example. This example turned into an exceptional success and now, farmers from all over the United Kingdom travel to the Duchy Home Farm, to gather the courage and knowledge they need, to convert to organic themselves. Prince Charles appears in an entirely unusual light, which forces the viewer to throw all prejudices towards him and organic agriculture overboard. The Initiative for food sovereignty was introduced by Uniterre, a farmer’s coalition that constantly fights for fair milk prices and worker’s rights in the farming industry. Uniterre’s goal is to implement the concept of food sovereignty in Switzerland with a people’s initiative. Currently we are gathering signatures so we can make it on the ballot and present the cause to the people of Switzerland. 1. A bio-diverse, farmer’s oriented agriculture, free of genetically modified crops through saving nature’s resources, taking care of the soil and protecting the seed variety. 2. Agricultural practices that give a great outlook to future generations, that future farmers have access to land. An agriculture that pays fair salaries to secure a sustainable income for farming families. 3. A market with more transparency: Small circuits should be supported, regional products should have a preference over far traveled ones which will increase and strengthen local jobs, decrease transport and increase trace-ability of products. 4. International trade should be fair. Regulating taxes for incoming products, taxes to export products through price-dumping are asked to be stopped. The initiative is asking for fair-trade, not free-trade. 5. Food sovereignty means the self-determination of a country over her own agriculture and food production, always in respect of others and in expectation of its own population. We hope you find a way to help this movement move forward in Switzerland or wherever you are in the world. It is a movement to think globally and act locally. Industrial farming is depleting our resources and dumping dangerous chemicals into our environment and above it all, it does not feed us. It is the small, local, family farm that is feeding us the nutrition we need to thrive, for our children to grow. Support this great cause, we hope to see you at the movie screening and are happy to answer questions and have a lively discussion. The success story of the DUCHY HOME FARM has its roots and beginnings in the year 1985, when Prince Charles was looking for a new farm manager, with whom he could put his ecological visions into practice. Is the farm manager of the Duchy Home Farm at Highgrove and had initially been trained in conventional methods of agriculture. In 1985 Prince Charles chose him to run the DUCHY HOME FARM. She is a scientist and social activist, and has received many awards for her involvement with environmental protection, women‘s rights and sustainability. Up until 1967 Hardy Vogtmann studied agriculture and food science at the ETH Zurich. He was appointed professor for agriculture at the University of Kassel in 1981, where he also held the first chair for organic farming in Germany. Zurück Vorheriger Beitrag: Gentechnik und Wissenschaft – Warum werden Argumente ignoriert?